I swear I have been looking for this dress my entire life. 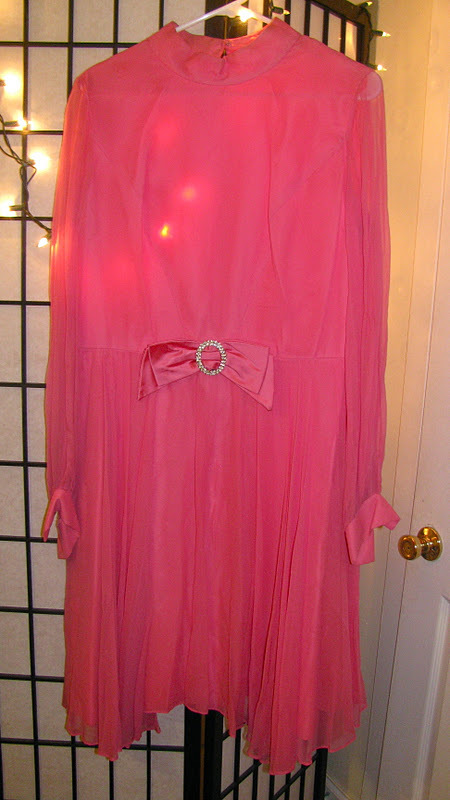 This is the kind of 1950's pretty party dress that you just know women like Grace Kelly or the fictional Betty Draper wore as teenagers. Back in the day, the norm was an hourglass figure with a tiny waist so it has been difficult to find anything similar in my size. I stopped at a thrift store, swearing I wouldn't buy anything since I was out of cash and just bought that petticoat/hat box, but I saw it and the color was perfect, the condition was amazing, and it surprisingly fit! I'm a size 10-12, but the dress is listed at 18! Talk about running small back then.. At a mere $15 for the kind of dress that would be $65 in other stores, I grabbed it right away. I don't care how insanely overdressed I might be, you know you'll see me totally rocking this pink perfection on my birthday next month!